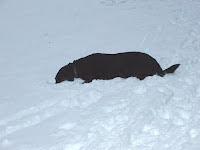 Adirondack Lifestyle ™: The Dog Adirondack Lifestyle - Puz you lucky dog. The Dog Adirondack Lifestyle - Puz you lucky dog. The Adirondacks are a great place to be a dog. No matter where you live, it doesn't take long to get out in the woods and pretend you are a real canine again. There are copious opportunities for swimming, walks, hikes, runs, snow baths, a ski and maybe even a little bird finding on the side. The resident lab, Puz, enjoyed all that and more for nine and a half years. The sometimes star of this blog, our handsome black Labrador Retriever, Puz, passed away on Monday. Fortunately, it was a quick illness. He was a goof ball until the end. This was a dog whose high tolerance for pain made him a big galoot. At 100+ lbs., you knew it when he stepped on your barefoot toe. Or "bumped into you" while you were skiing fast downhill and passing him. You knew it, but he was completely unaware. He had alpha dog syndrome, which meant he liked to be at the top of the heap. He learned to accept he wasn't alpha over my husband, Ed, pretty quickly. He had a longer learning curve with me however. We eventually worked it out and he even learned to do a downward facing dog yoga pose at my request. He was an awesome bird finding dog, but not so much on the retrieving part if the item in question had feathers on it. He'd retrieve anything and everything, as long as it wasn't feathered. He would thrash through the woods, sustaining major slices and cuts, but seemed to be completely oblivious to the pain. There was a time when we considered setting up a permanent Betadine bath so we could dip his entire body after an outing. His first ski of Whale's Tail Pass to Marcy Dam was bloody and memorable. He was still pretty young when we took him on this classic ski. The ski down into Marcy Dam is a blast although pretty steep and narrow at some points. Puz was running as fast as he could in the deep snow in order to stay ahead of us inferior creatures using those long things on our feet. Unfortunately, physics wasn't his strong suite, and he neglected to account for all those rules that made Ed catch up to, then run over him, on metal edged skis. The ski cut a huge gash in Puz's leg which immediately made the snow look like we had eviscerated someone. He was clearly annoyed with us as we called to him to stop so we could have a look at his leg. From all appearances, he had no idea his skin was hanging flapped opened on his leg and he was bleeding profusely. We rigged up a tourniquet with a bandanna and had no choice but to see if he could make it out. He was not slowed down one tiny bit the entire rest of the ski. We cleaned the cut and bandaged him with absolutely no response of pain from him. It was truly remarkable. Puz was a lovable dog too; he always had to be touching you, preferably leaning with all 100 lbs. He was a member of our family and a great Adirondack dog. A native Adirondacker, he was born in Paul Smith's, New York. Puz was my colleague here at the homestead office, my trail running, skiing and yoga buddy, and our ever present companion at porch time. He is missed immensely. Are You Smart Enough to Visit the Adirondacks? Cascade Cow Moose Loves our Neighborhood!